I disagreed, and told him that in a few years it would be the #1 highest traffic driver on the net, and the #1 reason for people to upgrade their (Cisco) routing systems. 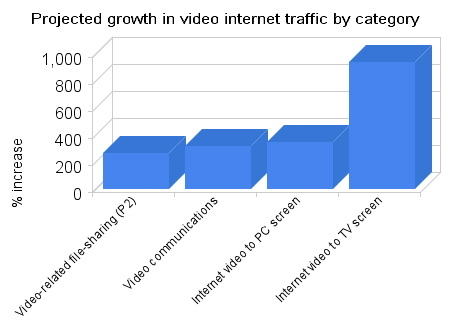 Though growth of 300%+ is nothing to sneeze at, what jumps out from this chart is that internet video shown on a TV screen, presently a paltry 332 PB (petabytes), by 2012 is estimated to be 3,458 PB- an increase of over 10x (1,000%) over the next three years. 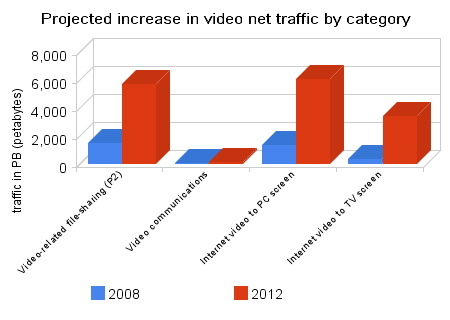 This means, by the end of 2012, internet video watched on a TV will be more than half the traffic of internet video watched on a computer. If this trend continues, after another few years TV will overtake the computer as the main screen people watch internet video on. That is not a huge surprise, but what does it mean? Since by 2012 almost everyone will have 1080p widescreen TVs, people will demand far higher quality internet video. No one’s going to watching YouTube video on their 52″ LCD… at least, I hope not! This bodes very well for the world’s best web video publishing tool, DV Kitchen, and the world’s best “video vending machine”, the MOD Machine. No doubt this is a great opportunity for all of us. Thanks a LOT for the MODmachine lead !